If you buy only one trade paperback this month, let this be it. 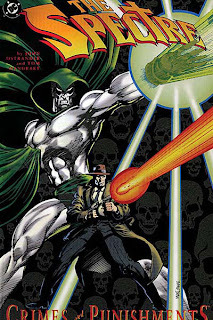 Spectre: Crimes and Judgments marks the first collection of John Ostrander and Tom Mandrake's dynamic, spooky Spectre series since the 1993 Crimes and Punishments trade (which I reviewed in 2011) that collected just the first four issues of the series. This new volume, collecting issues #1-12, is not only a great read, but also a canary in the coal mine, I believe -- good sales of this volume must necessarily help DC determine whether there will be future volumes, how they might treat the Ostrander/Mandrake Martian Manhunter collections starting next month (and vice versa), and whether we might ever see more collections of Ostrander's other works, namely Suicide Squad. If you're on the fence, I recommend snapping this one up. I passed over the Arkham Asylum: Living Hell miniseries when it first came out since one-off, unrelated tales of Batman villains aren't necessarily my thing, though the story was later brought into (the old) continuity in Batman: Face the Face. No question why DC would want to release a deluxe edition of this now, however, with art by Ryan Sook and story by Dan "Superior Spider-Man" Slott; probably a surprise a new edition of this didn't come out earlier. I recently read about the New 52 Deathblow in the pages of Rob Liefeld's Grifter Vol. 2 and it's hard not to think of the character as something of a too-1990s joke, but apparently he had the gumption once upon a time to deserve a three-issue miniseries written by Brian Azzarello, drawn by Lee Bermejo, and sharing the billing with Batman. If anyone knows why I might have misjudged Deathblow, please speak up. This collection of issues #17-21 begins -- SPOILERS ON -- the storyline in which Booster Gold brings Jonah Hex to the future. I have only been an occasional reader of this series, though seeing Hex in the modern era intrigued me (I'll probably pick this up for Booster's presence alone), but the fact that Hex seems to have returned to the past now and Booster's appearance didn't seem to have any far-reaching consequences all dampen my excitement. Seems the answer to "how will the Batman and Robin collections handle this series's ever-changing title" is, at least for the moment, to remain Batman and Robin. If you want to draw your own conclusions what that says for the future of this title, feel free. I'm just glad Peter Tomasi and Patrick Gleason are still rocking and rolling on this title (perhaps my favorite writer/artist mash-up); looking forward to this one. My shameful secret of the day is that I still have not read a single issue of Chew by John Layman, but I'll get there one day, I promise. In the meantime, Detective Comics's relative unimportance among the Bat-titles has moved it toward the bottom of my reading list despite Layman's presence, though I'll probably pick up this and Vol. 3: Emperor Penguin sooner or later; I'm interested to read the "issue #900 celebration" story collected here, if nothing else. New readers may not remember Frank Tieri's Gotham Underground mini-series from a couple years back; not a bad story necessarily, but it was meant to tie into Salvation Run, which was itself meant to tie in to Countdown to Final Crisis, all of which essentially fell apart. So because of the bad connotations, I'd personally hesitate before I called a new title "Gotham Underground," but that's just me. Catwoman is another one that's fallen toward the bottom of my reading list, again because it really doesn't forward the overall Bat-story and also because Ann Nocenti's writing style hasn't quite worked for me yet. At the same time, this is the trade that introduces the popular Joker's Daughter character (I'm not sure if this character is popular because of her intrinsic worth or due to having "Joker" in the name right after Death of the Family and some short printing of the Villains Month issue causing undue speculation), so I'll probably check it out at some point to be "in the know." Includes said Villains Month issue, naturally, but excludes issue #25, a Zero Year issue by Layman (hopefully to be collected in some sort of Zero Year tie-ins collection). The latest multi-title crossover collection, the issues of which (depending on your source) can also be found in the individual Green Lantern, Corps, New Guardians, and Red Lanterns titles. Includes the Villains Month Relic issue, but then again so does Green Lantern Vol. 4: Dark Days. I've not read an issue of Gail Simone's The Movement and I don't mean to pre-judge (obviously I like Simone's work in general), but from what I understand the series isn't selling well, and Green Team, launched at the same time, has already been canceled. All of which is to say that, though this volume collects issues #1-8, I wouldn't be surprised if the volume was re-solicited to include issues #1-12, let's say. Surprisingly, Red Lanterns Vol. 4 -- the "Lights Out" tie-in volume -- also includes Green Lantern Annual #2 (the "Lights Out" conclusion), the same as Green Lantern Vol. 4 and the Green Lantern: Lights Out collection. I guess this is good if you're not reading the other Green Lantern titles, as it gives you an end to the story whereas the individual tie-in volumes to Trinity War, H'el on Earth, Culling, etc. just included whichever of the series' issues tied-in, reading experience notwithstanding. At the same time, like the Death of the Family collections, at some point when you've had Batman #17 in four different collections, you start to get tired of encountering it (and further, I think said conclusion begins to lose some of its impact). Last but not least, someone with a better memory than mine can say for sure, but I believe this Showcase Presents book was solicited and then canceled for resolicitation back in 2009, and now here it is five years later. To be resolicited, indeed! That's what I'm reading. But hey, what are you reading? Sad to hear your indifference about Living Hell, as it's one of my all time favorite books. Hope you give it a shot. I probably have too much new stuff piling up to turn back to it, but I appreciate your speaking up on the book's behalf and hope others take note. I think you should look it up as well. It's smart, funny, entertaining and everything that an Arkham book should be. In fact, I think this is the best title to carry the name 'Arkham'...and Sook's art should look beautiful in the deluxe format. *Infinity Gauntlet Omnibus HC--After months of requesting this, my prayers have been answered. Much of this has been collected in "Silver Surfer: Return of Thanos", the main "IG" trade and the "IG Aftermath" trade, but this also includes some tie-ins that I don't recall being collected before. I'm kind of surprised Marvel didn't collect the original Avengers/Two-In-One Annuals story for the sixth time in the last two years. *Miracleman Book 1: A Dream of Flying HC--Celebrate one of the greatest works of the writer of "Watchmen" and "V For Vendetta", The Original Writer! That legal term is so clunky that I have to believe that Alan Moore specifically chose it. In all seriousness, I'm strongly looking forward to reading the sainted "Miracleman" and seeing what Marvel has in store for it, especially once Neil Gaiman's parts start. *Thanos Rising HC--This was a controversial series and I'm interested to see which side is right: the "interesting retcon" side or the "abomination unto Jim Starlin" side. *Nova Vol. 3: Nova Corpse TPB--I didn't think anything would get me to read the new Nova series, a.k.a. Jeph Loeb's public mourning therapy. Not even Gerry Duggan taking over would do it, and I love "Deadpool". And then they added Beta Ray Bill... you win, Marvel editors. *The Twelve TPB--Just a reminder that this is possibly the best book JMS has ever done, and you should get it immediately in the trade form if you haven't gotten the hardcover. *Spider-Man Epic Collection: Ghosts of the Past TPB--The "Epic Collection" line is kind of weird; as best as I can figure, it's their way of putting out large chunks of old comics that don't directly correspond with a famous storyline. In particular, this one has a collection of 80s Spidey from the Roger Stern era but not written by Stern. This trade is especially worth the price because it collects Peter David's early ASM stories, including the brilliant "When Cometh The Commuter", in which Spidey is thwarted by the lack of high-rises to swing from in suburbia. I plan on waiting till all of Miracleman is put in some nice deluxe or omnibus or something. It's gotta look nice on my Alan Moore shelf. A space has been reserved for it for YEARS. *Frank Miller's Big Damn Sin City HC--Because I'm sure somebody asked for it, here's the "Sin City" omnibus. It doesn't list the contents but it claims to have everything ever done on the title; I'll assume Dark Horse knows what they're doing. *Two Past Midnight TP--With the exit of "Star Wars", Dark Horse is putting a lot of time and effort into their superhero characters. This is effectively the "Trinity" (the Matt Wagner one, not the weekly series) for their lead characters and a key part of what's to come. Plus it's only ten bucks. *Rocketeet/The Spirit: Pulp Friction HC--I've been looking forward to this collection for a while, especially since my appreciation for Waid's "Daredevil" work has grown appreciably. *In non-trade news, holy crap look at that cover for "Transformers: More Than Meets The Eye" with Megatron. I'm reading "Dark Cybertron" and even I don't know how the hell that's going to happen, but I really want to find out. *Glory: The Complete Saga HC--If you haven't picked up "Glory" yet, here's the best way to do so. Depending on the extras, I might even double-dip and pick this up despite having the first trade. *Pretty Deadly Vol. 1 TP--I'm compelled to pick this up as a member of the Carol Corps (the dog tags are on my keychain). There was an infamous incident in which a comic book store owner ripped up a first issue and was praised for it, so consider this recommendation a "screw you" to those who decide to take out their feelings that way. *Three TP--Not only does this look like an awesome title, but it might just get me to review "300" for Collected Editions for a back-to-back look at two retellings of the same events. *Velvet Vol. 1 TP--Here's another trade for the Criminal and Sleeper fans, even if it's by another artist. Then again, said artist is Steve Epting, so the quality won't dip. Brubaker and Phillips have a long-term contract with Image to do these kinds of stories, and while they're not my kind of thing, I look forward to their success. I wonder when are they going to reprint Morrison's Batman run and Johns/Tomasi/et al GL run. I wouldn't be surprised if we saw a Geoff Johns/Green Lantern omnibus in the not too distant future. I'm less sure the Tomasi material would be included; I love me some Tomasi/Gleason GL Corps, but I sooner see DC printing an omnibus with just the Johns/GL material. They would have to include AT LEAST the crossover issues. Sinestro Corps, Blackest Night, War of the GLs, etc. Re: Arkham Asylum. I suspect you're mistakening the very strong Living Hell miniseries with the more recent set of "villian one-shots" under the Joker's Asylum banner, which I found passable. Like Jordan, I'd endorse the very smart Dan Slott/Ryan Sook storyline. A fair and interesting guess. No, however, I indeed do remember when Living Hell came out and I skipped it for the reasons I mentioned, which I realize might not be everyone's reasons for reading/not reading a book, but they are mine: that non-continuity villain-focused stories just aren't my bag. I do respect your and Jordan's recommendation of it, though, and indeed the book won a place on the DC TPB timeline when James Robinson brought it into continuity.